At the time of writing this recap, it’s been over an hour since end of the Bobcats-Hawks game, and I still can’t believe what I saw. Stephen Jackson, while double-teamed and with the clock winding down, faded away and caught nothing but net on a shot that won the game at the buzzer. But that wasn’t the only thing that absolutely boggles my mind. Try these on for size: the Bobcats came back from a 22 point deficit; the Bobcats had a reserve score 22 points; AND Stephen Jackson scored efficiently. And all on the tail end of a back-to-back. The end result was a Bobcats win over the Hawks, 88 to 86. But the whole game was an extremely difficult fight. Even in the first quarter, the Bobcats found themselves down by ten points early. Luckily they recovered, with the help of Livingston, who had eight points in the first quarter. They went into the second quarter tied at 27. The second quarter for the Bobcats was a disaster of epic proportions. Charlotte was down by 22 points and allowed an 18-0 run by the Hawks at times during the quarter. It wasn’t until 2:26 left in the quarter until a Bobcat made a field goal. And by that time, it seemed like the only thing separating the Bobcats from their 32nd loss was about 24 minutes of game time. The starters, outside of Gerald Wallace and Jackson, were completely awful. And Livingston was pretty much the only redeemable thing about the game, scoring 12 points by halftime. Meanwhile, Atlanta was hitting their shots from all over. In the first quarter they attacked the paint, but in the second, they hit shots from all over the court. But there’s a reason they play 48 minutes, right? In the third quarter, you could see the Bobcats beginning to right the ship. An ineffective, poorly-shooting Augustin was replaced with Shaun Livingston, who played out of his mind. The defense tightened up, allowing only three Hawks attempts in the paint. Gerald Wallace even did un-Gerald Wallace-y things, like hitting three treys. Livingston picked up where he left off, dropping 6 points and two dishes. And Stephen Jackson came to life, playing more efficiently on offense, even drawing a few fouls. The game came into reach as the quarter ended, Hawks up 72-68. As the final period of play began, one could feel the Bobcats taking complete control. They were getting shots that they wanted and more importantly, the Hawks weren’t able to attack Charlotte’s main weakness: defense in the post. Even D.J. and Gerald Henderson added some points, despite their rough nights. More importantly, Jackson was rolling. Whenever Stephen Jackson can get to the free throw line, it’s going to be a good night for him. And boy, was it for him tonight. 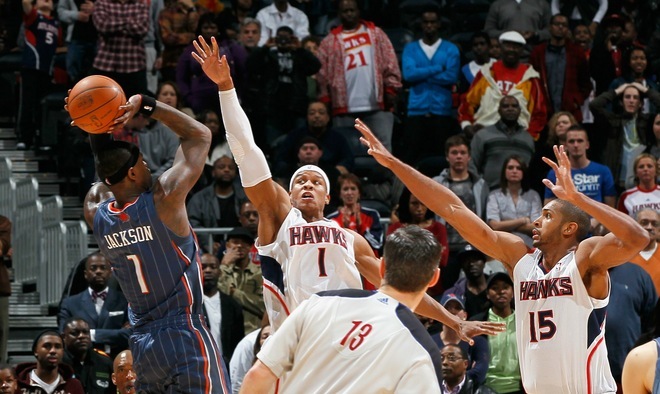 Despite the Bobcats’ desire to pull away, the Hawks wouldn’t let that happen. While their offense wasn’t getting much of anything, their defense helped force the Bobcats into bad shots, making the game struggle at times when both teams took time off from scoring. But after a pair of Jackson free throws to tie up the game, the Bobcats stifled the Hawks on their next possession and Stack Jack a long, tough mid-range jumper to put Charlotte up by two. But Atlanta struck back with an Al Horford score and getting possession after Livingston missed a jump shot. And then it was crunch time. Tie game at 86. Atlanta squeezed as much time from the clock but couldn’t also get a good shot, with Joe Johnson bricking a 21-foot shot. Bobcats ball with a little over five seconds left. Coach Paul Silas called for a time out, which moved the ball up court. Eduardo Najera inbounded the ball to Jackson from the sideline. And he just stood there. No one else even moved. Then Jackson took a single dribble back, towards Najera’s defender! Then, with about .8 seconds left, he jumped and faded away from the two defenders, hitting the bottom of the net and winning the game. I was dumb-founded. I’m still dumb-founded. The Bobcats have never been really effective using isolation plays. And over a double team? I could have sworn we were headed to overtime. And it’s not just that. Shaun Livingston had 22 points! The Bobcats haven’t had a reserve score that many points since November! I’m just in awe over all of this. When is D.J. Augustin going to find his shot? We need his offense quite badly. Boris Diaw was pretty bad tonight too, just so it doesn’t go unsaid. Gerald Wallace was really good. I didn’t want anyone to think I missed that. Good defense by Jackson and Henderson on Joe Johnson (4-14 FG, 11 PTS) and Jamal Crawford (1-9 FG, 2 PTS). I hate you, Mike Bibby. Eduardo Najera, I don’t like you much either, but you’re better than Bibby, I guess. The Bobcats are now 23-31 and face the Lakers on Monday, in Charlotte. Watch out for the bandwagon fans if you go. Josh Smith destroyed Eduardo Najera with a single dunk. Well, I guess they can’t always be Shaun Livingston plays, haha. You can follow Cardboard Gerald, Dr. E, and ASChin on Twitter at @CardboardGerald, @BaselineDrE, and @BobcatsBaseline. You can find more of Cardboard Gerald’s writing at Bobcats Break and now at Stacheketball.